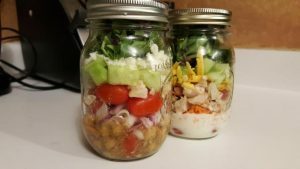 Left jar (starting from the bottom, Kraft Greek Feta, Cherry Tomatoes, chickpeas, red onion, more cherry tomatoes, cucumbers, goat cheese and mixed greens). I brought one to work today. This one is my youngest sons favourite. 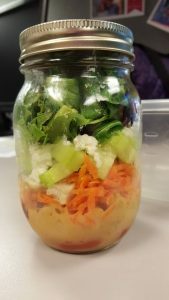 Starting from the bottom, Asian Sesame, Cherry Tomatoes, chickpeas, red onion, shredded carrots, cucumbers, goat cheese and mixed greens). Previous Post Flipp’n over this app!